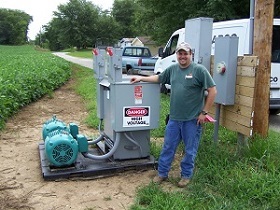 Ryan Facemire owns and operates Facemire Farms in Franklin, IN. In the summer of 2013, they wanted to install an irrigation system which included a 50HP Vertical Hollow Shaft Pump and Center Pivot System. Since they only had a 240V 1PH power supply available from the local utility company at the jobsite, they needed a way to convert the 1PH to 3PH and supply a 480V 3PH power source to operate the irrigation equipment. Mr. Facemire contacted ARCO Electric Products in Shelbyville, IN about finding a solution to their power supply problems. After gathering the electrical information on the equipment load, ARCO Electric Products was able to recommend a rotary phase converter Model CHD2PVR460XT2PC as well as size a 75 KVA 1PH “step-up” transformer. Mr. Facemire purchased the phase converter & 1PH transformer from ARCO Electric Products which enabled him to operate his 3PH irrigation equipment and irrigate his crops that summer.